TJ Maxx will give you a free bottle of water if their cashiers don’t bombard you with store discount credit card offers! 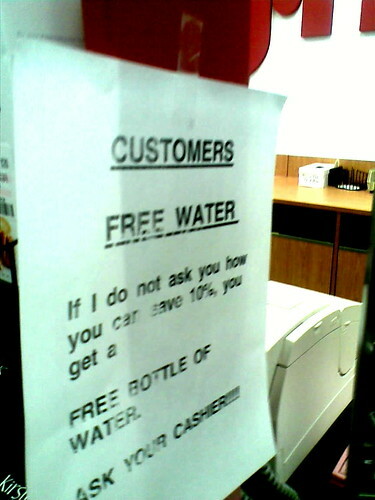 Because the one thing you most want to weasel out of a retailer is free bottled water. 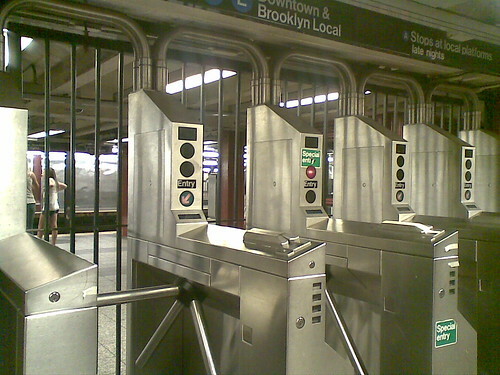 Subway turnstiles, A/C/E line. The gates are closed, but the turnstile card swipes are still on. The price of inattentiveness is $2. I paid dearly. 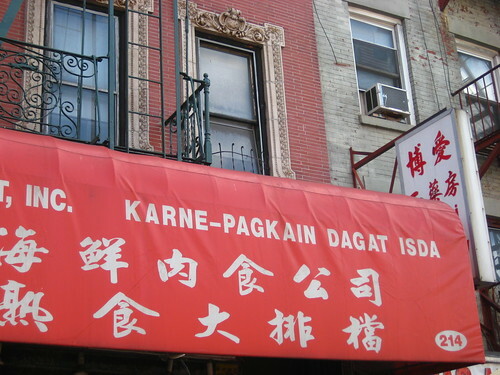 I spotted this Tagalog text on a market awning in Chinatown. “Karne-pagkain dagat isda” translates directly as “Meat-food sea fish” AND MAKES NO SENSE. 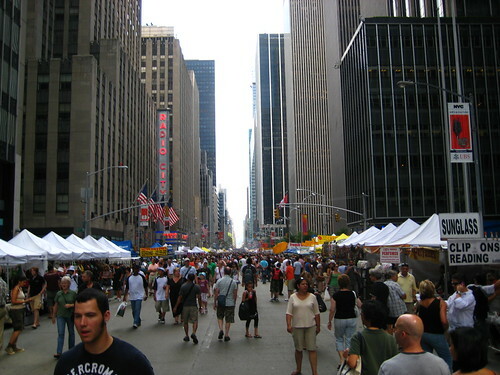 After we abandoned plans to visit MoMA or the Guggenheim, we saw this street festival on 6th Ave. It went on and on forever; we entered at 56th Street and walked down as far as 43rd Street and didn’t see the end of it. There were gyro/souvlaki stands at every corner, and the same vendors of jewelry, handbags, and sunglasses, on every block, mixed with other exotic sellers. Highlight of the afternoon for me was the discovery of a spice vendor with sichuan peppercorns. I bought 7 grams for a future preparation of ma po tofu. What is the point of these? There is no point. These sunglasses defy all explanation and good sense. More in this photoset, including a short New York movie cobbled together from quick, shaky videos shot from my SD1000. Nothing particularly awesome about it other than that it’s my first production made with iMovie ’08 on my MacBook. Those shades are for style, my friend. I remeber having a pair just like that when I was 5 (a.k.a 1990). Only mine were Teenage Mutant Ninja Turtle themed and they had a hole in the middle of the frame to squirt water out of. So rad! 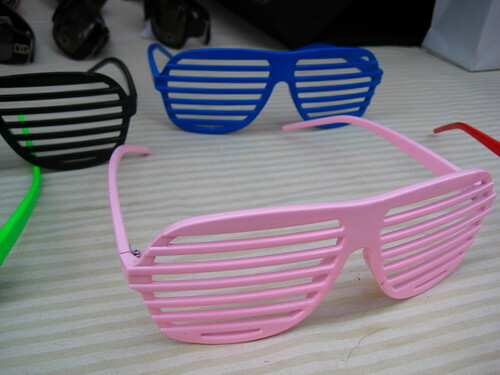 those are kanye west shades/glasses. hehe.